Recently I stumbled upon a Green Charmoula recipe because of a photo that looked interesting, but the reviews of it were seriously lacking. And even though I’m still not a fan of cilantro, the ingredients looked intriguing, using both parsley and cilantro with a side of mint and jalapeno. So I decided to give it a go, knowing I could doctor it up as needed. So far I’ve used this on flat bread pizza, as a spinach salad dressing, drizzled across baked sweet potatoes and then as a light spread on a chicken salad wrap. Talk about versatility! It whips up in seconds, no cooking required. And with these great health benefits (see Happy Health Tips below), adding a second helping is almost a requirement! Place the jalapeno, parsley, cilantro, mint, ginger and lemon in a blender (or food processor). Pulse to combine and chop everything up. Begin to add in the olive oil while running the blender, letting the all the ingredients combine mince into a paste. 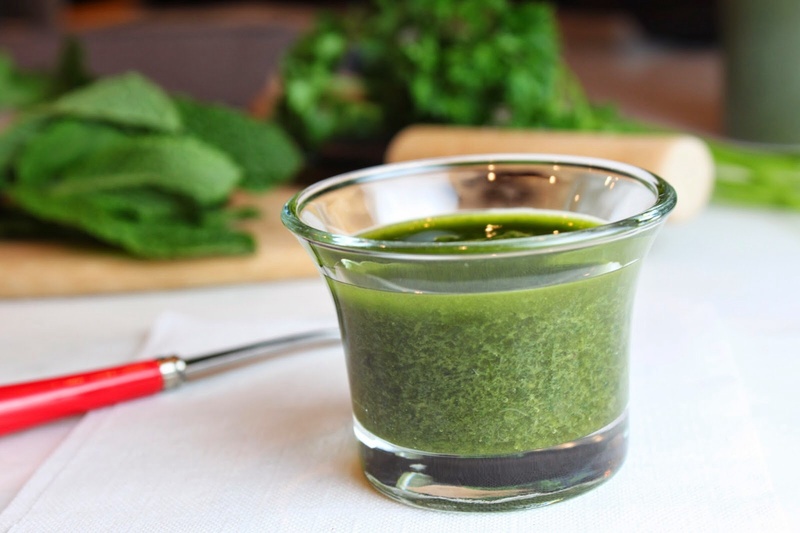 Decide if you want a vinaigrette or a more spreadable pesto, add the oil to get desired consistency; then add a good pinch of salt and pepper to taste. Spread on bruschetta, over grilled pork, use in place of mayo, drizzle on a salad or over baked potatoes. The uses are really endless. Will last a few days in the fridge, but allow time to come to room temperature. Happy Health Tip: Parsley and ginger have anti-inflammatory proprieties while cilantro helps to remove heavy metals and other toxic agents from the body. The extra virgin olive oil is a healthy fat that helps protect our brain and liver.